Show your love and support for the law enforcement by wearing this beautiful Thin Blue Line American Flag Scarf Style 2. 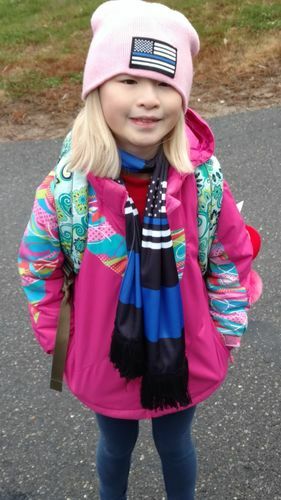 It is a fashionable scarf for any police officer to wear. It's a perfect gift for any law enforcement officer who supports the meaning behind the Thin Blue Line. Surprise them on their birthday, on Valentine's Day, or Christmas Day with this Thin Blue Line American Flag Scarf Style 2. I thought it would be woven....My fault for not reading more. It is a bit short if you want to tie it. Jade loves the silky smooth feel.\nShe said it is very comfortable.